One of my German friends/colleagues complained on Facebook yesterday that she was proofreading files and the translator had changed Vereinigtes Königreich (United Kingdom) to Groß Britannien (Great Britain – but spelled wrong, because it should be Großbritannien). If it was just one file it wouldn’t have been a problem to correct it, but the problem here was that the translator had changed it in 148 separate files. There’s a shareware tool for that! 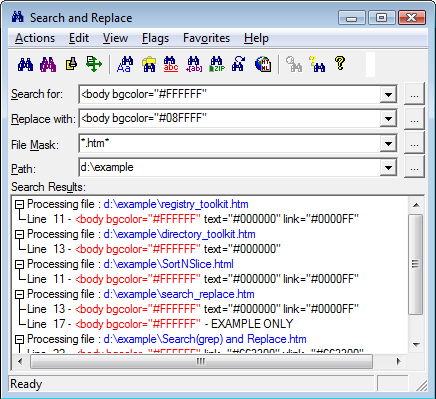 Search and Replace by Funduc Software is a great little tool that can easily fix this problem. It “searches through one or more files files for a string and can also replace that ‘search hit’ with another string. It can even search for the string inside .ZIP files, which can be a handy feature to have. Search and Replace is also available in international versions. As they explain on the Funduc website, “Language interface downloads are available below for German, Danish, Dutch, French, Italian, Portuguese, and Spanish versions. Some older Japanese, Greek, Norwegian, and Swedish modules are also available.” You can also write support@funduc.com if you need an older language dll that is not listed. You simply install the English version and then add the language support files into the Search and Replace program directory. This is a must-have tool for translators. I can’t tell you how many times I have relied on this tool. Search and Replace costs $25.00, Replace Studio Pro costs $30.00 and Replace Studio Business Edition costs $37.00. I have been perfectly happy with Search and Replace for years now. Windows XP, Windows 2003, Windows Vista, and Windows 7. 32-bit and x64 versions are available for all three tools. An ongoing debate in our industry is whether or not to push the distinction between an interpreter and a translator. We in the industry all know that interpreters talk and translators work with the written word, but people outside the industry automatically assume I am an interpreter when I say I am a translator. I have to explain to almost everyone I meet that I prefer to “sit behind my computer and find the perfect word” instead of rambling on until my point gets across (because, believe me, if I were an interpreter that would be EXACTLY what would happen – I was not blessed with the gift of off-the-cuff speaking like my interpreter colleagues…). It certainly doesn’t help that those in television, movies and print media don’t even know the difference. We all cringe when we hear “We need a translator in here!” when a police officer on a show like Law & Order: SVU or CSI needs to interview a witness who doesn’t speak English. But it seems only a translator or interpreter even notices the difference. The most recent episode of The Good Wife is a good example of this. An ongoing storyline features America Ferrera’s character as an undocumented worker who had been brought to the States at age 2 and was working as a nanny for the political opponent of the main character’s husband. The husband’s cunning political consultant leaked the story, but has fallen for her character so he was secretly trying to get her naturalization paperwork pushed through and even saved her father from being deported the week before. This past week she was working as an intern for the main character’s law firm. She just happened to notice a mistranslation in a previous translation that gained them a decisive advantage in the deposition between an oil company and a drilling company that was owned $87 million and just happened to be nationalized by Hugo Chavez that day. She then interpreted for the team of lawyers in the deposition – and even for Hugo Chavez in Venezuela via a monitor. Her efforts won them a settlement – all as a lowly intern. What a gal! The need to stress one minor point is still desperately needed though… As one of my colleagues so concisely put it “The skill and training to translate and/or interpret in one direction does not mean you can do it in the other. People unfamiliar with the work involved somehow imagine that anyone who translates German to English, for example, can obviously translate from English to German (or Chinese to English, for that matter — “it’s only a couple of sentences!”)”.